Contemporary artists are increasingly combining elements from the visual arts with the performing arts. In addition to working on their oeuvres individually, artists enjoy the challenge and added value of collaborating with other artists and presenting their creations to live audiences. Furthermore, theatre directors and choreographers often look for a more visually expressive language. 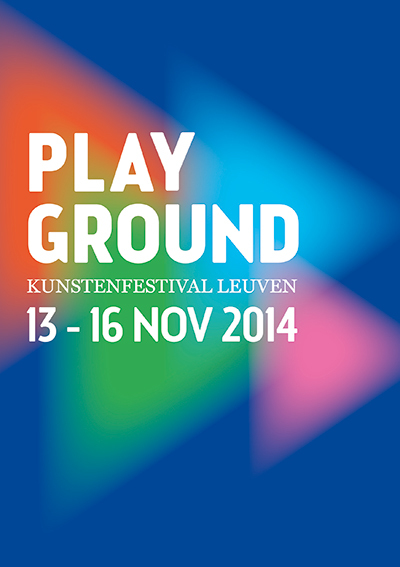 For the eighth time, Playground is exploring the captivating zone between these various artistic disciplines. The silent aspect of the visual arts contrasts with the public nature of the shared live performance. Artists reflect on the ways they might transform their visual vocabulary within the parameters of time and space on the stage. Many of the performances invite you to question and explore themes and (artistic) objects in unusual, unconventional ways. Action or interaction predominates over the objective nature of what is presented. Two artists, Ellie Ga and Markus Schinwald, are presenting both a museum exhibition at M and a live performance at STUK. In the new creation by Joëlle Tuerlinckx, her visual universe is translated into a performance experience that blends text, image, and sound. There is also new work from Alexandra Pirici & Manuel Pelmus, in which performers in the exhibition space transform a series of well-known artworks into continuous actions. The performance by Béatrice Balcou is like a ceremony for one single artwork. At STUK, Meryem Bayram is presenting a scenography that focuses on the mobile installation of large pop-up shapes. And there is also new work by Julian Hetzel, Guy de Cointet, Marthe Ramm Fortun, Paul Hendrikse and Alexandre Singh to be discovered.